Based on the popular blog Almanac of Eats, EAT THE YEAR is a tribute to food-lovers everywhere and a fun calendar cookbook that introduces a national food or drink holiday for every day of the year. From National Baklava Day to National Cheese Lover’s Day, and from National Whipped Cream Day to National Bloody Mary Day, author Steff Deschenes includes an array of food holidays that are as diverse as they are delicious. EAT THE YEAR includes 366 food-related quotes from pop culture (one for each day of the year – even Leap Day), fun food facts and trivia, cute commentary, a little bit of food history, 50 recipes, and whimsical two-color line drawings all packed into one fascinating culinary journey. I’ve often been inspired to share a recipe based on a food holiday. You must have heard of some of them and there are A LOT of food holidays. Just about every food you can think of is celebrated at least one day a year…or so it seems! Steff Deschenes took the concept of food holidays and started a blog on the topic. Every day she would eat recipes from whatever food holiday it was that day. This fun idea grew in popularity as readers started following her blog and now she has written a book on her area of expertise. Eat the Year is a fun, easy read full of interesting commentary, recipes, trivia and more. It includes 366 food-related quotes from pop culture, 50 recipes to try and even some food history. Keep it on your bedside table and read a chapter a day starting with the current day or indulge a little and read it in one sitting. Today, October 14th, is National Dessert Day. Steff notes that it is also National Chocolate Covered Insect Day. Who knew there would be a day for that??? I’ll stick with desserts thank you very much. It’s an engaging read and Steff’s personality shines through in her commentary on each day. I marked down a few of the recipes to try including Shepherdess Pie for National Clean Out Your Refrigerator day on November 15th. I also liked the random food facts being the trivia buff that I am. Impress your friends with your knowledge of when the first Yorkshire pudding recipe was ever recorded – it was 1737! I also learned that eating almonds increases sperm count…..that I did not know! 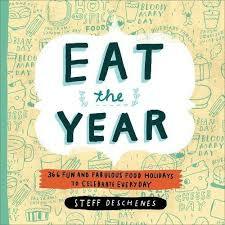 Eat the Year would also make a nice gift for a foodie in your life. I’m keeping my copy handy so I can use it for inspiration when I’m stuck in a dinner rut. I don’t know if I’d have the energy to do a food holiday every day for a year, but I do plan to try a couple! Great review, thank you. I’ll have to check this out. I love reading books about food and looking and trying different recipes. This book sounds amazing. I think it is a book that I would like to read!! This sounds like the perfect book for my brother in-law. He loves to read cookbooks and other books about food. He is always trying new recipes. So this would be perfect for him. Thanks for the review! Sounds like a fun and hunger-inducing read! Sounds like an interesting/fun book to read! Thanks for the review! Ewwwww to National Chocolate Covered Insect Day. Haha! I love books like this–will have to check it out. Thanks for the review! I like when a cookbook has a bit of commentary and fact tidbits in it. This book is right up my alley, thank you for telling us about this! I read cookbooks like they were a story on a page. Love this book. I am a foodie so I would definitely LOVE this! Putting it on my list! i do love cookbooks and this sounds like a great one. Thanks for sharing. Sometimes these books make the best presents too. I like the concept of daily food holidays. Would be a fun book. I will definitely be getting this book for my colleague- sooo him! This seems like a really good book!! Love how it has trivia and lil funny tidbits all about food. Have to get this for my daughter! She loves learning and following the different holidays. Dessert day was yesterday and Grouch day today. This book is a year long gift to her to share with others. Great title too. Sounds like a fun book to read. It would make a great gift for a few people in my family. Interesting concept for a book! This would make a great Christmas gift. You had me at National Cheese Lovers Day! This is the kind of book I would really enjoy reading! My grandma is a real foodie, so she would probably really like this book! What a great review. Sounds like a book my Mom would really like. Definitely bookmarking for a gift for her. This sounds like a really cool way to plan my meals for the week! I think it would be a lot of fun to get a platter of different cheeses for National cheese day or learn how to make Baklava on National Baklava Day. So much fun to be had! I’d never heard of this book, but it sounds really interesting! I’m in agreement – let’s skip the National Chocolate Covered Insect Day and stick to the desserts! Sounds like a fun book, though I doubt I’d be able to stick to whatever food was the subject of the day. This book sounds awesome. I love all the random little holidays, so this would be right up my alley. This sounds like a great book, definitely something I would purchase either for myself for as a gift for someone else. Thank you for sharing this post.